3.1 Where is Carmen Sandiego Hugo? Recently – totally motivated by the #TidyTuesday-spirit from the magnificent #Rstats / #R4DS community, I finally forced myself to set up Blogdown with Hugo & GitHub Pages. Following Blogdown (and Bookdown(!)) creator Yihui Xie’s book-ish manual, it took me less than an hour to see an older .Rmd notebook of mine being rendered as a .html on MY first-ever personal website. 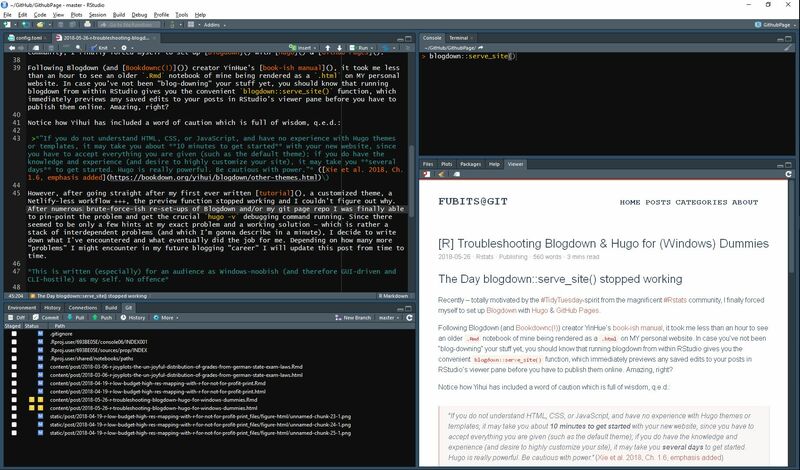 In case you’ve not been “Blogdowning” your stuff yet, you should know that running Blogdown from within RStudio gives you the convenient blogdown::serve_site() function, which immediately previews any saved edits to your posts (whether .Rmd or plain .md) in RStudio’s viewer pane – before you have to publish them online. Since there seemed to be only a few hints at my exact problem – which is rather a stack of interdependent problems (and which I’m gonna describe in a minute) and no tailored working solution, I decide to write down what I’ve encountered and what eventually did the job for me. Depending on how many more “problems” I might encounter in my future blogdown-blogging “career” I will update this post from time to time. OK, so let’s briefly have a look at my environment in which I set up Blogdown & Hugo & GitHub Pages. This actually should be true for any basic R @ Windows 10 user. blogdown: The RProject for my blogdown website (=source) is located in my local GitHub folder since it has been initialized as a repo <GitHubPage_Raw>.4 However, I’m working with two folders = two repos. config.toml: I’ve decided to re-locate the page’s \public folder to my <myRepo.github.io> repo5 and therefore to separate the page’s (raw) source from the rendered output. GitHub Page: That’s for a different topic, actually, but since I’ve separated my blogdown page source from the /public folder, it’s somehow relevant to my problem. To sum up, my raw page source and thereby editing environment is located in %HOMEPATH%\Documents\GitHub\<GitHubPage_Raw>\6 and the rendered website is located in %HOMEPATH%\Documents\GitHub\<myRepo.github.io>\. At some point, blogdown::serve_site() stopped previewing my edits and executing this command gave no error message. At the same time, the .Rmd files would still render / output properly. I was able to git push them to my <myRepo.github.io> and see the html posts on https://ellocke.github.io/. I wrongly supposed that this had been caused by messing around with the theme’s CSS or the config.toml file, but even with the default theme and/or config.toml the preview in RStudio would not launch. As suggested in almost any resource on Blogdown & Hugo issues (cf. here), running hugo -v should be your first step. Of course, on Windows that’s neither working from CMD nor from RStudio’s terminal by default, since both do not know what the hugo command is supposed to be or where to find the binary. What’s next? Eventually, I came up with 3 approaches and would recommend the third one. If you’ll continue blogging with Blogdown/Hugo on a regular basis, this seems to be the most convenient result (!= effort). in CMD or Explorer’s address field. This is the folder where we somehow need to execute hugo -v.
Mission achieved! Well, partly…. You fixed what you needed to, but are you going to be able to easily redo this the next time you run into Hugo problems? Let’s say when you write your next in post in like a couple of months or so? I probably wouldn’t. Remember: hugo -v is your first option and you need to run it in your page’s source folder. Therefore, we might want to register Hugo (or rather hugo.exe) with Windows as a USER variable and make launching Hugo a stable method. Follow this steps from Hugo’s offical documentation and simply add %APPDATA\Hugo (or an absolute path, if you managed to put hugo.exe somewhere else) to the user path variable. Reboot Windows. Either call hugo -v from afar, or set the path variable and run it without reference. Voila! We did some nice stuff for your average Windows user. However, there’s one even more elegant and streamlined way which I totally would suggest to set up and use for your standard workflow. As documented here, with recent Windows 10 builds you can now implant a Linux subsystem (i.e. Ubuntu) into your Windows environment. 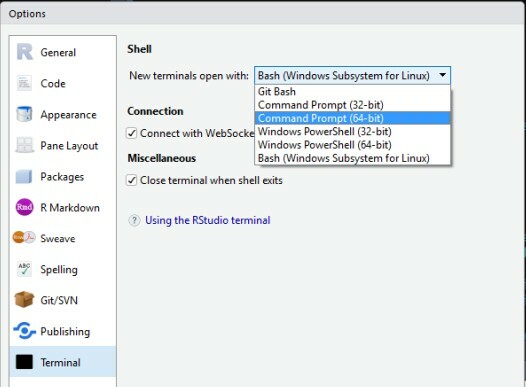 So if you decided so install Linux for your Windows system, make sure, that bash is your default shell (see above) and launch a Terminal in RStudio (Menu->Tools->Terminal->New Terminal or Alt+Shift+T). When this is done, run hugo -v in the Terminal anytime without ever leaving RStudio.7 We don’t need to navigate nowhere (if you’re running the command from you site’s source’s project in R). We don’t need to set a user path variable. We’re done. It’s probably because you either made (legit) changes to your config.toml while the preview was still running or you made a syntactical mistake to your config.toml or your .Rmd post’s yaml-header while/before the preview was running. In these cases the preview fails to (re-)render. UPDATE: As Yihui has pointed out, the seImpl() problem was Windows-specific and has been fixed in blogdown v.0.7. .rs.restartR() # keep the leading "." For tomlparseImpl (syntactical error in config.toml) you usually get a pointer at line **XY**. Double-check what you did there, undo it when in doubt, and then restart your session and try previewing again.